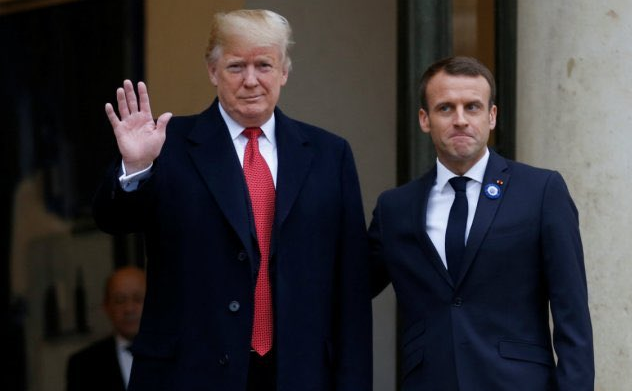 The blossoming bromance that once seemed to occur between US President Trump and French President Macron seems dead and buried after the latter’s Secretary of State blasted the US President for critical tweets over the weekend. Paris wants US President Donald Trump not to interfere with the domestic policies of France. This is what Foreign Minister Jean-Yves Le Drian said on Sunday in the French press. Related coverage: Yellow Vests – French Government Blames Moscow For "Fake Social Media" Revolt. This was clearly not received well by the French government. Via its Minister of Foreign Affairs (Secretary of State) Mr Jean-Yves Le Drian, the White House was urged in pretty harsh terms to refrain from interference in the domestic policy of France. He furthermore reminded the French public that most Americans disagreed with US President Trump over his decision to walk away from the 2015 Paris climate agreement. Mr. Le Drian furthermore stated he was "worried" about democracy and institutions in France when he heard a certain number of statements made by members of the opposition parties which explicitly referred to calls for "uprising" and “revolution”. French President Macron is expected to address the worries of the protesters in the days to come. It remains an open question whether this will stop them from continuing their disapproval of his government though. Was it Louis the 14th ? Or was my history lesson wasted ? If Macron keeps this up France will become just another third world country the US will be forced to invade to protect the French people from the French government and the foreign invaders from africa and the middle east. It will be like going back to Iran all over again. Trump is being targeted to take the heat off of Macron. Macron and his communist globalist government are responsible for the unrest in France. Global warming is a myth created by a bunch of globalist freaks to have an excuse to take over the world. The world has had ice ages and heat waves for thousands of years but pollution had no affect on it. Macron like Merkel does not care about his country or the French people. France needs new leaders who will get them out of the UN. The UN is just another front for satan and his communist, globalist agenda. I agree with Le Drian that yellow vests probably weren't chanting "we want Trump" but maybe at their next demonstration they should, even if just to give Macron and his government the pip. I also sense that French do not hate Trump like the British. There don't seem to have been many demonstrations against him during his 2 visits to France. HEY Le Drian, YOU BETTER BELIEVE MOST AMERICANS LOVE PRESIDENT DONALD J. TRUMP WHOLEHEARTEDLY. HOW ELSE DO YOU THINK HE WAS ELECTED PRESIDENT OF THE UNITED STATES?!! IN SPITE OF THE ILLEGAL VOTES THAT PLAGUED OUR VOTING SYSTEM. THEY NEVER THOUGHT SHE WOULD LOSE!!! BECAUSE THEY WERE CHEATING. WHO OWNS YOUR VOTING MACHINES? MAYBE LE PEN WAS SHORTCHANGED. APPARENTLY MOST OF FRANCE HATES MACRON, SINCE HIS RATINGS HAVE DROPPED TO 18% AND THEY ARE DEMANDING HE RESIGN. IT LOOKS VERY SUSPICIOUS TO THE REST OF THE WORLD. DO YOU HAVE FAKE NEWS THERE TOO??! !